Bought a Pearson 38-DC last June and fixing her for cruising. Capn Kirk here, have been steadily working on my boat and just finished redoing the starboard exhaust yesterday. I already cruised her 3 hours up river but now want to take her for day/weekend trips in hopes of working up to a Great Loop journey. I am hoping that someone else has a motor yacht like mine so that I can find out how to best do things. I have all the old manuals for this 1988 model and I understand that there are very few that were made. Need to figure out the AC system the documentation is not very good for them. Anyway, I will share what I have and hope that there is someone else out there with a similar model to mine. Looks like you can replace it with a Ritchie Helmsman HF-742 or HF-743. I'm looking for a compass for my Renegade. At least I think that is what was there? There is a small porthole in the cockpit companionway step that has a bracket underneath with a wire. It is about 3" in dia. My original equipment list for the renegade shows that it came with a 3" Flush Mount Corsair Compass. Well, mine is missing, and I'm trying to locate a replacement. I'm thinking those Corsair Compasses must have been sold to at least a few different manufacturer's around that time, so they probably ended up in more than just the Renegade. Just having a tough time tracking them down. If anyone has any ideas on who I might give a shout to, or of any other yachts those compasses may have been installed in, I would truly appreciate any tips anyone might have. Here we are high in the Cascades on our way to Vayu's new home port in Montana. Greetings all! I am brand new to the forum and very grateful to have found it. I am the proud new owner of Vayu, a 1967 27' Renegade, #107. Hope you kind folks don't mind us odd balls joining in. I see most of the folks here have the 323's (a mighty fine yacht from what I am reading here). I am very impressed with the workmanship and durability of the Pearsons they seem very well built and crafted with quality materials. Mine was very well maintained by her previous owners so I don't have any major work to do off the bat, which is good. Her old home was out in the Puget Sound/San Juan, area so she has been a salt water gal for most of her life. She'll now be sailing the smaller freshwater lakes of Montana for the near future anyway. My previous boat was a Victory 21' so I am looking forward to the extra space in Vayu. I know she's only 27', but she seems huge to me right now. I'm sure I'll need lots of help with maintaining her and I'll have a bunch of questions, so I ask for your patience with this newbie. Does anyone know if there are any other Renegade owners on the forum? Thanks again to all who manage, participate, and support this site and forum, it is a great resource. I know you posted this about a year ago, but I was wondering, (and hoping), if you got her all put back together? Hello Nebraska - I did my formative sailing & racing in the Colorado region, with a few trips to Lake McConaughy where we often encountered big winds. I am curious where will you will keep your P323. Thanks for joining - I have added Flyer to the "Pearson Model Categories" for General Discussion specific to the Pearson Flyer. 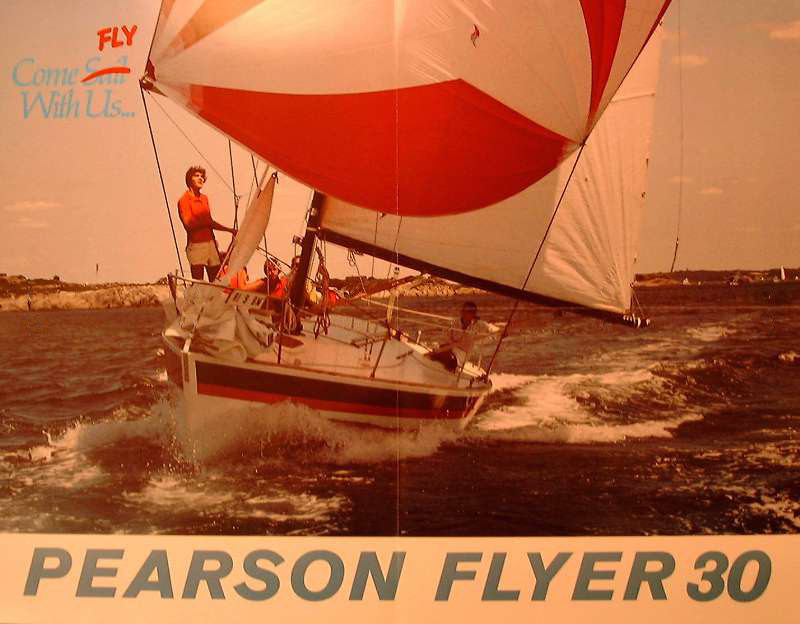 Note from Webmaster: We have a preliminary "home" page for the Pearson Flyer on this site that contains brochures and/or drawings (http://pearsonyachts.org/models/pearson-flyer.html). We are looking for owners/moderators to assist in expanding this content. Email Webmaster@pearsonyachts.org for more details.